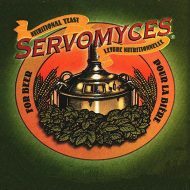 Servomyces is a naturally enriched single-strain brewing yeast that is used as a biological yeast nutrient. The propagation and drying process of Servomyces has been specifically designed to accumulate a range of trace minerals and elements that are essential or limiting during alcoholic fermentation. Does not contain GMO materials. Minerals, when incorporated into some sort of living tissue, are more efficacious than when presented as a salt. Servomyces presents better bio-availability of minerals, which is a very important factor in yeast nutrition. Stimulates uptake of maltose and maltotriose, depending on the brewing strain, which results in higher alcohol yields. Stimulation of protein synthesis and yeast growth which leads to higher biomass production during propagation. It is reported that Servomyces eliminates harsh sulphur notes and produces asmoother more balanced beer. 1 g Servomyces is used for 100 liters of wort for fermentation. 2 g Servomyces is used for 100 liters of wort for propagation. Practical trials have shown that addition of Servomyces should be made to the kettle about ten minutes before the end of the boil.